Sorry I haven’t been posting more photos of da Tour de Fleece… my special pōpoki, ʻUkulele, has been really sick. She is sixteen years old and for the past couple of weeks I’ve been having to give her Sub-Q fluids and meds. She has spent the last three days at the vet’s getting IV fluids and I’ve been going in twice a day to visit her. I’m bringing her home today, then tomorrow she has to have her blood drawn again to see where we are. One of her favorite things to do is to bring me balls of yarn that she’s “killed”. She is so proud of herself, and I praise her like crazy when she does it. 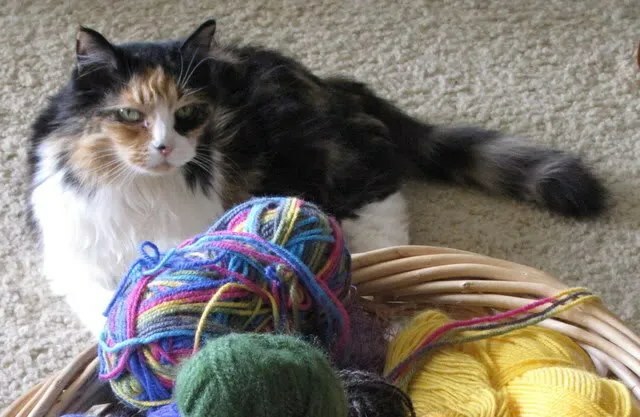 What’s a little cat saliva on yarn, anyway? I hope she continues it when she gets home and rests up; it’s one way I can tell she’s having a good day. She’s beautiful. Hoping the sub Q fluids bring her right round and she can enjoy her time at home again. Best wishes to Ukulele! Too many friends lately have been losing older kitties, I hope you get more years with yours. I’m sorry to hear about your kitty. I’m thinking good thoughts for the both of you. Just met up with you on Ravelry! Thought I’d hop over to your blog and say Hi. So sorry to hear about Ukelele. Please give her a gentle stroke from me! Hi again Mokihana – been thinking about you and Ukelele all day and wondering if she’s any better… I can’t get on Ravelry at the moment – it’s not loading properly and I can’t access any of my messages. P.S. Thanks for your LOVELY messages on my blog!! !